Last night our friends came over and we cooked pasta in the kitchen while it rained outside. Sauteéd onions on a low simmer in a lot of olive oil, added tomatoes and eggplant. It was so nice to cook together, to sit and drink wine and talk. After the rain passed and the sky cleared a bit, we had glimpses of Machapuchre, the beautiful mountain that looms over Pokhara with her sisters. My friend, who is from Italy, told me that I would love Tuscany. The seasons, the food, the love that goes into the food. I am certain of it. And I thought about it again. We have to eat, we have to cook. With four little ones I have to cook a LOT (except in those moments when Jaya is in my life- though even then I have to shop) and I realized a long time ago that I would enjoy it more if I got a bit geeky about it, if I obsessed over seasons and vegetables and colors. So that is why I nearly fainted with delight when I found this vegetable market in Mahindra Pul, the big shopping district of Pokhara. The Farmer's Cooperative market. Here I found the freshest vegetables, I found mushrooms, I found tofu. After laughing at me for a while, for taking pictures, the vegetable seller struck this wonderful pose. Melissa Westemeier of Green Girl in Wisconsin has written a great review of The Eve Tree on the Eco Women Site. You can read the review here: If you like Barbara Kingsolver's books, you'll LOVE the Eve Tree. Thanks so much Melissa, for a thoughtful and thorough review! I am proud to be able to announce that my book, The Eve Tree, is available at the following online stores. You can buy it in print at Amazon.com: here. As a NookBook on Barnes and Noble: here. As various kinds of e-book formats on Smashwords: here. Be sure to take advantage of the $4.99 introductory e-book price. The Eve Tree is distributed in Canada, the UK, and Australia as well, so check your country's Amazon page. Your search will go better at this point if you search for "Rachel Devenish Ford." It should be available for Kindle in a matter of hours. I'll update when I find out. It will also be available as an ibook and a Kobo book shortly. And as a print book on the Barnes and Noble bookstore. Also, very soon you will be able to order it from your local bookstore. A side note: You may notice that on some sites it is listed as out of stock. Go ahead and order, the books will be in soon. We had a little last minute crisis when a Pre-release reviewer asked about a certain donkey in the story. When I checked in the pages, it turned out he was AWOL. With a few changes, he is back where he belongs. Whew! The distributor will have the book back in stock very soon. I will be hanging out on Twitter and here in the comments at around 6:00 onwards PST, if anyone wants to chat about writing, the book, or anything else. It MAY be that there is a small delay in getting the books restocked at Amazon, once the ones they have are gone. Should be fixed soon. Again, blame it on the donkey. However, there are some enterprising souls who are selling the book for more than I personally charged for it-- just to make you aware. The books should be back in stock soon. To be perfectly honest, on any given day I go through about a hundred different emotions. I'm like some five-year-old girl with outfits. Now the pink dress! Now the leggings with the tinselly t-shirt! Now the overalls! Except for me it's Melancholy! Melancholy with a slice of nostalgia! Anger! Self-pity! Overwhelming joy! It's exhausting. 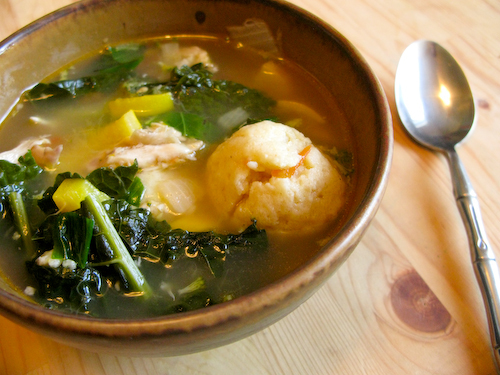 And, in exhaustion, it's wise to turn to Matzo Ball Farmer's Market soup. I once blogged about clean out your fridge soup. Tonight I'm going to tell you what was on our table this evening. "Good food can only come from good ingredients. Its proper price includes the cost of preserving the environment and paying fairly for the labor of the people who produce it. Food should never be taken for granted." We have a lot of poorly produced food available to us at very low prices. And that is a tempting thing. But one small thing I've learned while in India is that self-denial can be a huge key to appreciation. So if we eat less meat and ice cream and more beans and so are able to afford locally grown vegetables, that little bit of self-denial allows us to support small farmers. And take care of our waistlines, which will thank us for less meat and ice cream. And we then appreciate meat day when it comes around, that much more. Anyhow. One lesson I've learned about Farmer's Market is that there are a wide variety of costs presented. There are exquisite chocolates and divine honey. Those are treats... oh my word, the honey is good. But if you're going on a budget, well 80 cents a bunch for kale is not a bad price at all. Kale, summer squash, lettuce, tomatoes, potatoes... you can find really good prices from excellent farms. I started off by simmering the chicken bones in water for a long time. A few hours, and then straining the bones out of the broth. and added salt and pepper. When the vegetables were firm but cooked, I added them to the broth and undertook the task of getting the tiny bits of chicken that were still left off of the bones and into the pot. This is really annoying. I hate that part. I opened the pack of Matzo ball mix and thanked God once again for his People and the gift of Matzo balls. Putting together the mix was super easy, just eggs and oil and the mix, left to stand for fifteen minutes. While it was standing, I chopped a bunch of kale and added it to the soup, as well as making a chiffonade of a few basil leaves (the herb of the day) from my plant. 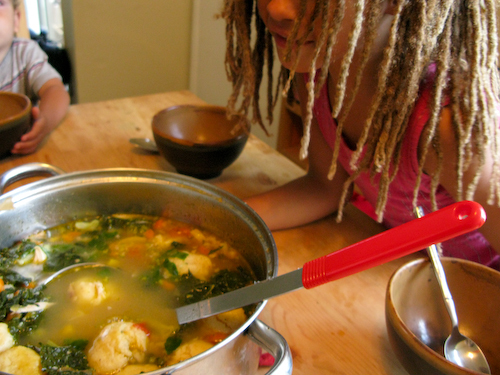 I turned the soup up and let it really boil for dropping the matzo balls in. Done! Beautiful, delicious, affordable, delicious, and delicious! But these players can be used with any vegetables you find to make a really good soup. Maybe you use green zucchini, maybe you throw purple cabbage in, maybe you use fresh thyme instead of basil. P.S. Here's a post that I wrote at around this time last year.